Skiing station Zieleniec Ski Arena has almost from its very beginning functioned as a place where entire families with younger and older children are the most welcome guests. Family nature of our centre is expressed not only in the proper and very diverse offer when it comes to skiing slopes. It is also a rich offer of the local guest houses and hotels where no one will get bored when they come back from the slopes, diverse and delicious cuisine and numerous attractions for the youngest ones with a pool and animation classes inclusive. 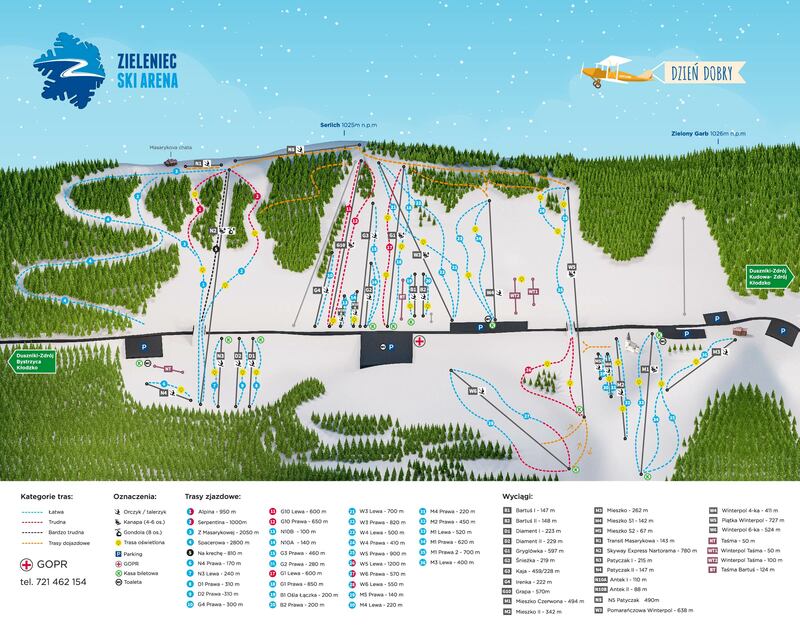 22 kilometres of routes, 29 ski lifts (including 4 modern couch lifts). Zieleniec is above all a rich and constantly developing skiing infrastructure. 22 kilometres of routes in Zieleniec are characterized by various lengths and levels of difficulty. Therefore, each member of a family, regardless of their level of ski skills fill find their place here. Similarly in case of ski lifts and coach lifts in case of which there are twenty two in Zieleniec. The ski resort, thanks to the fact that the majority of routes is equipped in artificial illumination systems, is open from 9:00 to 22:00. While the parents, well-experienced skiers wish to throw themselves into the whirl of demanding and longer ski routes, their little ones may be gaining their first victories and improve their skiing skills on milder slopes, using the belt lifts, of course, under a watchful eye of their trainers and ski instructors. Ski season which lasts for almost 150 days a year is long enough to get a chance to rest and use the most beautiful season of the year and the unique conditions to the fullest in Zieleniec. When coming to Zieleniec with the whole family, it is worth to stay here for longer. There is a multitude of arguments speaking in favour of such a solution. One of the most important ones is a rich offer of the local hotels and guest houses, which will welcome and provide care for guests at any age. Internal play rooms for children, perfectly adjusted to the needs of children at all ages menu as well as swimming pools, SPA resorts and many other attractions make our guests, ranging from the age group of 1 to 100, not feel bored at any point while staying in Zieleniec. Zieleniec Ski Arena is not only Alpine skiing. There are also some spectacular, many kilometres long, beautiful routes of cross-country skiing. Many of them are located on the Czech side of the border which, however, does not take away any of its attractiveness whatsoever (it is rather quite the opposite). Furthermore, thanks to the availability of routes of our southern neighbours, their total length exceeds 200 kilometres. What’s more, they are diverse in almost all terms-both when it comes to their length and, above all, their level of advancement. Both the skiing beginners and the experienced ones and those who wish to become the successors of Justyna Kowalczyk, pursuing cross-country skiing challenges will have great fun here.